The following are a sample of the enrichment programs offered at Aranda Primary. Aranda Primary has two bands - a Year 5 and a Year 6 band. Both bands have a variety of woodwind and percussion instruments. These groups are part of the ACT Instrumental Music Program. Students in Year 5 are assessed as to their suitability for participation in the program at the beginning of the school year through a listening test. No previous instrumental experience is required. The twenty-three students invited to join the band will have demonstrated co-operative team skills. A commitment to home practice is essential. Students continue in the band for two years. Costs are associated with participation in this program. The school annually enters a range of these competitions which are for students in Years 3-6. The competitions offer extension experiences in English, Mathematics, Writing, Science, and Computing. There is a cost for these competitions. Students have the opportunity to extend their musical skills through singing and breathing instruction in our Junior and Senior School Choirs. All Year 5 and 6 students participate in the ACT Public Speaking Competition organised by Rostrum each year. One student is selected to represent the school at the interschools competition. Students from K-6 have the opportunity to develop their strategic thinking skills and have fun playing chess at our lunch time Chess club. 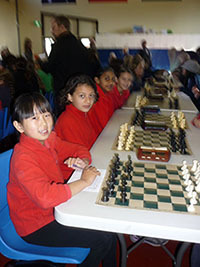 In Term 1 the Chess Club is open to girls only aiming to develop a love of the game in a small supportive group. From Term 2 on the chess club is open to everyone of any ability level. Throughout the year regular players have the opportunity to participate in interschool chess competitions. This provides students with the chance to play other students from across the ACT and enjoy coaching from experts in the junior chess league. Expertise from a variety of performers, authors and guest speakers is highly valued at Aranda Primary School. Students have opportunities to participate in a wide range of stimulating programs that are incorporated into ongoing classroom programs. Students from year 1-6 that have demonstrated particular aptitude in the area of writing have been given the opportunity to further develop their writing skills. Once a week the students meet as a group and participate in a variety of writing activities aimed to challenge and develop their writing technique, vocabulary use, sentence structure and understanding of genre. Students in Kindergarten that have been identified as having an excellent understanding of letters, sounds and words, are given the opportunity to work together twice a week to develop their reading skills. The students’ are challenged through a variety of activities aimed to develop their understanding of word meaning, reading comprehension and reading strategies. This group aims to develop the student’s understanding about reading for both meaning and enjoyment. Aranda Primary has a range of robots for use across the school. Cubettos in Kindergarten, Beebots in Years 1 and 2, Spheros in Years 3 and 4, and Lego Mindstorm EV3 in Year 5 and 6. Students are engaged in a variety of coding and problem solving activities. There is also an opportunity for students in Years 5 and 6 to be involved in the Robotics club held once a week.